Neely pictured with Will Gibson, MD. There was so much to do and so much to look forward to! Diane Neely had decided to retire early in May 2017 and was making plans to travel, spend time with her family, focus on her health and get involved in volunteer work. When she discovered a lump in her breast last year, all those plans came to a halt. At Parkwest Breast Center, Neely underwent imaging to determine what the lump was. When it became clear that it was cancer, radiologist Amanda Squires, MD, approached the situation with a positive attitude, emphasizing the excellent outcomes for patients like Neely. After her biopsy, Neely went to surgeon Will Gibson, MD, who delivered the news that Neely had triple negative breast cancer. Cancer cells tested negative for estrogen receptors, progesterone receptors (PR), and Human Epidermal Growth Factor Receptor 2 (HER2-), and Neely knew that meant options for treatment could be limited. But “limited” isn’t a word commonly associated with breast cancer treatment at Parkwest Medical Center. 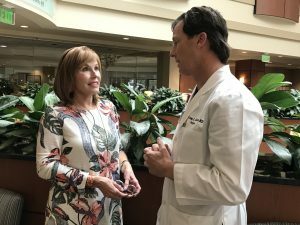 When Neely’s chemotherapy was finished, Dr. Gibson performed oncoplastic reconstruction, a surgical procedure that allows the cancer to be removed with minimal damage to the breast. After chemotherapy and surgery Neely underwent radiation therapy. She says she was comfortable that radiation has proved over time to be an effective cancer treatment. Before the treatments began, Neely learned in a support group that a new technique is available at Thompson Cancer Survival Center in downtown Knoxville. The technique is called deep inspiration breath-hold. During DIBH, patients undergoing radiation are given instruction in how to take and hold deep breaths so the heart moves away from the chest, making radiation safer and more effective. The technique is used primarily for treating left-sided breast cancer like Neely’s, and can also be used during stereotactic body radiotherapy for lung cancer. Neely also qualified for a clinical trial drug to reduce the chances of the cancer coming back. Triple negative cancer is a threat, but with a multidisciplinary approach, the most comprehensive treatment and a team willing to fight for Neely’s life, she has won her cancer war. In November 2017 Dr. Gibson had given Neely the worst news she had ever received, telling her she had triple negative cancer. But months later, he was also the one who delivered the good news that Neely was cancer-free. Neely says the way her family rallied around her was incredible. Friends and cancer survivors came forward to offer a level of support she won’t soon forget. Neely compares having cancer to being on an emotional Ferris wheel that’s spinning out of control. Now that she’s on solid ground, she’s ready to start planning good things for the future again. Download this entire edition of Health & Lifestyles.